Investigations of languages with additional quantifiers have a rather long history. This history starts in 1957 with Mostowski’s paper . Next, Fuhrken [1, 2] Keisler  and Slomson  investigated properties of the language with such quantifiers as ‘there exist infinitely many’, ‘there exist uncountably many’, ‘there exist as many as all elements’ etc. In  Henkin proposed to investigate the quantifier which arose by writing the existential and universal quantifier parallel. Some people (see e.g. ) used this idea to construct a language and investigate its properties, mainly the syntactical properties. Only in  we find remarks about a connection between the quantifier defined by Henkin and other quantifiers. 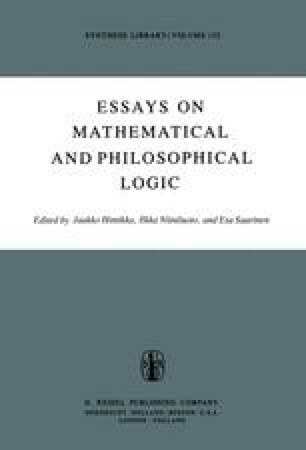 In this paper I want to throw some light on the semantical properties of the language with the quantifier defined in  and especially on its connection with the second order logic. These results were obtained in collaboration with Professor A. W. Lachlan and will be published in detail. I use the standard model theoretical notation as in .